Dimensions: 8 1/2" x 12"
This handbook is designed for teachers who want to foster fairminded critical thinking in instruction. The ideas in this handbook should not be considered an “add on,” another set of procedures and activities to do in the classroom. In other words, the ideas, concepts, and strategies presented in this Handbook are not something you add to your curriculum. Rather, they provide you and your students with intellectual tools that applyto the learning of all academic subjects. They apply to all learning activities. Once you have grasped the theory of critical thinking, you will find that it is relevant to everything you doin the classroom—to all of your content and instructional activities, and to all classroom management issues and student interactions. The intellectual tools to which you will be introduced in this Handbook come from the work of Richard Paul and Linda Elder andare designed to foster fairminded critical thinking. This Handbook is designed to be usedin conjunction with The Miniature Guide to Critical Thinking for Children (Elder, 2006). When internalized, the intellectual tools which are the focus of this Handbook and the strategies for using them will affect how you approach your content and how you help students think within thecontent. When you teach using these intellectual tools, your students will learn how to identify the purposeof the content they are studying. They will learn to raise relevant questions, find and interpret significant information, understand key concepts, evaluate underlying assumptions, consider logical implications and practical consequences, and look at issues and situations from different points of view. The lessons in this Handbook have been developed primarily through the work of Drs. Levin and Borman with elementary school students in classes where their focus was on helping teachers of these students foster criticalthinking. 574M Teacher’s Handbook for Critical Thinking for Children $13.45	 Qty. This section introduces you to some of the most basic concepts of critical thinking, includingthe parts of thinking (for analyzing thinking) and the intellectual standards (for assessing thinking). We also include in this section the DOXI1, a learning strategy based on the work of Paul and Elder thathelps your students understand these and other important concepts. Fifteen critical thinking lessons are included into this Handbook. They exemplify methods which, when broadly applied, can transform your classroom into a place where criticalthinking is at the heart of everything you do and what your students are consistently working toward. In essence these lessons show you the kinds of activities and materials that can foster critical thinking. Consider these lessons as a starting point. As you develop your understanding of critical thinking you will create new ways to help your students become fairminded critical thinkers. We have especially focused onlessons which help students apply critical thinking concepts and strategies while reading and writing. This section introduces the critical thinking game which is basedon the critical thinking toolbox. It has proven to be an effective and engaging instructional aid, exercising students’ thinking about critical thinking, fostering creativity, and encouraging empathetic student camaraderie. This section explains how to create and use the critical thinking game. It provides a detailed description of the steps and materials needed to construct and play it. A model lesson using the critical thinking game is also provided. 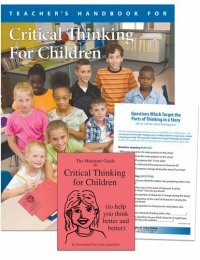 This section introduces you to, and provides detailed instructions for, the administration of the Critical Thinking Test for Elementary Students, developed and field-tested by the authors and by Linda Elder. Included is a reproducible copy of the test. This test is designed to assess your students’ progress in acquiring critical thinking skills. You can administer it not only as students enter your class and at the end of the year, but throughout the school year. The Master Rubric for the test provides a convenient way of presenting the test data in numerical form. In today’s data-driven educationalsystem, this test provides the hard numbers that will satisfy the ever-present demand for standardized measurements. But, it depends on your own understanding of critical thinking. Only those with a good understanding of the parts of thinking and intellectual standards will be in a position to grade the test.